CHICAGO — Children’s and young adult authors, illustrators and publishing groups are waiting in anticipation for the 2014 American Library Association (ALA) Youth Media Award announcements. The ALA will announce 18 awards at 8 a.m. ET on Monday, Jan. 27 from the Pennsylvania Convention Center's Grand Ballroom A, in Philadelphia. The awards include the esteemed Randolph Caldecott Medal, Coretta Scott King Book Awards, Michael L. Printz Award and John Newbery Medal. The awards honor children’s and young adult authors and illustrators, as well as producers of children’s audio and video materials. Recognized worldwide for the high quality they represent, the awards serve as a guide for parents, educators, librarians and those interested in providing youth with the very best reading, listening and viewing materials. 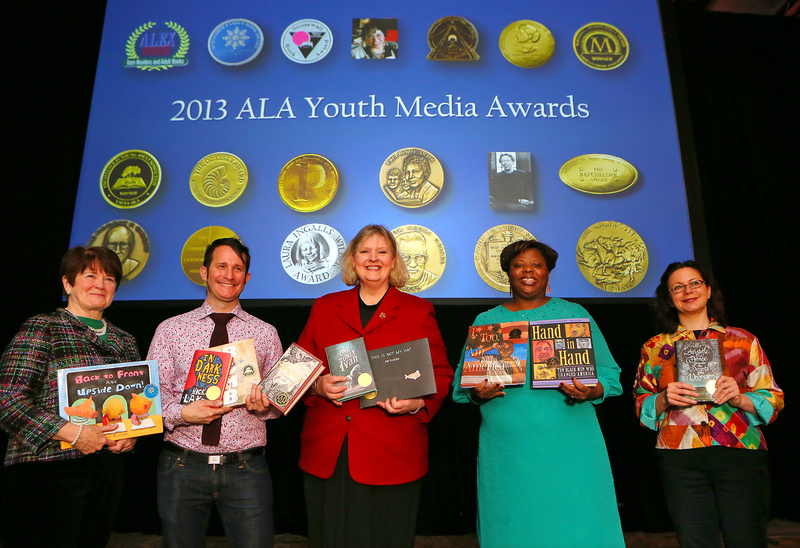 The ALA Youth Media Awards fuel reading programs in school and public libraries. From coast-to-coast, youngsters and teens are participating in mock elections in an effort to identify this year’s Newbery, Caldecott and Printz winners. For example at Weston (Conn.) Public Schools second graders are participating in a mock Caldecott election and created campaign materials to persuade other students to vote for their favorite title. The Northport (N.Y.)-East Northport Public Library’s Newbery Club hosts a mock election annually each January and predicted the 2013 Newbery Medal winner “The One and Only Ivan,” by Katherine Applegate. Local youth selected the title weeks before the Newbery Medal announcement. 2014 marks the 5th anniversary of the William C. Morris Award. First administered in 2009, the award honors a book published by a first-time author writing for teens and celebrates impressive new voices in young adult literature. In honor of the Morris Award and the YALSA Award for Excellence in Nonfiction, librarians and teens are participating in the Morris/Nonfiction Reading Challenge. Participants are reading 2014 Morris and Nonfiction finalist selections prior to the ALA Youth Media Award announcements on Jan. 27. For more information, visit http://ow.ly/s9HEK. The ALA will provide a free live webcast of the announcements, courtesy of 3M Cloud Library. Viewers are expected to join more than 1,300 onsite audience members. Live streaming efforts will begin the morning of the announcements at http://tinyurl.com/alayma14. Those unable to join the webcast can follow real-time results via Twitter @alayma or with the #alayma hashtag, and the ALA Youth Media Awards Facebook page at http://www.facebook.com/alayma. In anticipation of reaching capacity, the ALA will offer additional seating in Room 201C where attendees can view the announcements via live webcast. After the announcements, the ALA website at www.ala.org/yma will feature an award wrap release detailing 2014 selections. Also later in the day winning authors will post video messages to the ALA Youth Media Awards YouTube Channel at http://www.youtube.com/ALAYouthMediaAwards. Media are welcome to attend the announcements. For advance media registration, or to schedule interviews, please contact Macey Morales, media relations manager, ALA, at (312) 280-4393, mmorales@ala.org. The global leader in Library innovation for over 40 years, 3M is committed to helping libraries connect with the diverse and rapidly evolving communities they serve. The 3M Cloud Library simplifies eBook lending with user-friendly apps and intuitive buying tools. This gives librarians more time for what they do best - helping people. Visit 3M.com/cloud for more information.